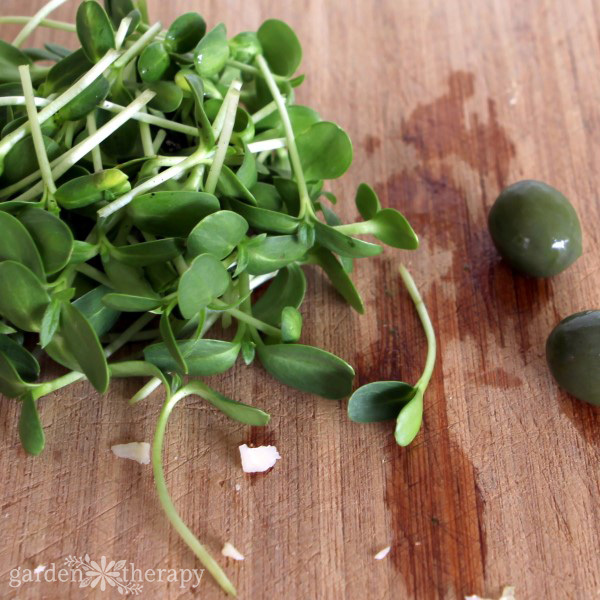 Sunflower microgreens are deliciously nutty with the flavor of raw sunflower seeds but the texture of spinach. They are easy to grow in just about any container you can find around the house, such as clear plastic salad-mix boxes. 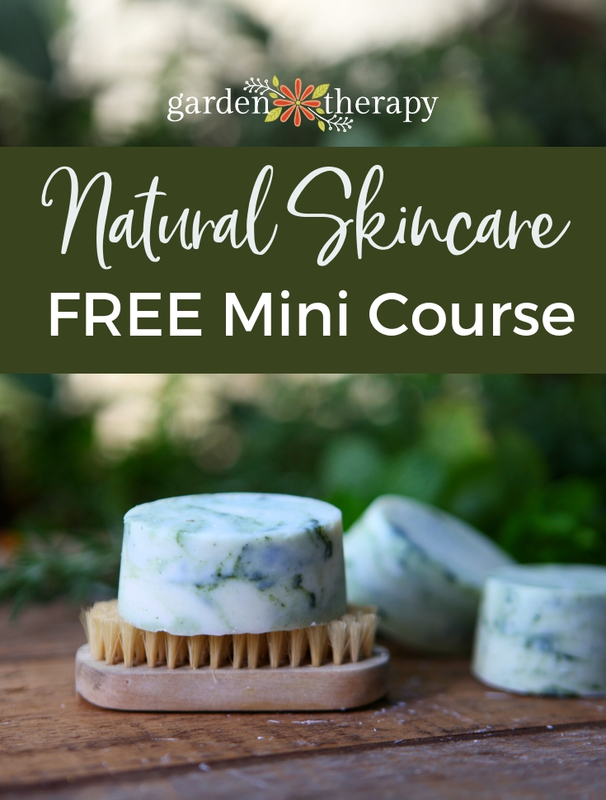 This post shares a detailed set of instructions on how to grow deliciously tasty sunflower microgreens that are healthy and (more importantly) safe to eat. No fancy equipment is needed for this high-brow salad trimming. I used a biodegradable plastic salad box (make sure it’s food safe by checking the plastic number here); it’s the perfect soil tray and greenhouse. You could also use a milk jug cut in half, a cake tray, chicken dome, or whatever you can imagine that would create a mini greenhouse. Of course, you can use a dome made specifically for growing microgreens like this one. The benefit of the store-bought dome is that it fits a standard seedling tray and has vents to allow humidity to regulate. 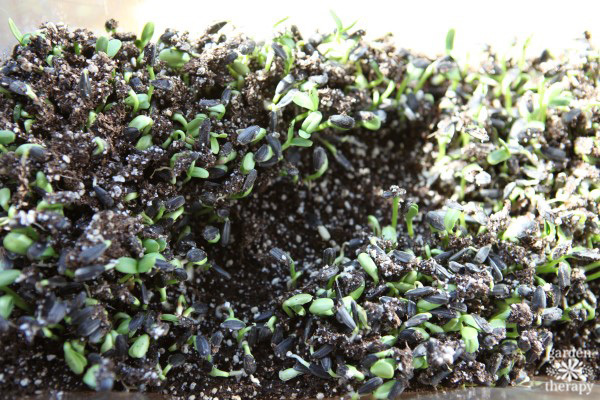 Use organic black oil sunflower seeds specifically labeled for sprouting, or grow your own! Many people want to use the ones that are packaged as birdseed, but I strongly don’t recommend doing that as they are not regulated for human consumption. I always buy my sprouting seeds from a trusted source that intends them for sprouting to ensure safety. You certainly could use the raw striped sunflower seeds sold as snack foods (as long as they aren’t roasted or salted, and still have shells). I’ve used them before and they work well. Black oil sunflower seeds taste a bit more flavorful, so if you like the striped ones, then venture out to try the others someday. You don’t need much, but choose your soil wisely. I use a sterilized seedling mix because it’s light and clean. Why not just use garden soil, you ask? First, soil gnats! Ugh, those annoying little flies that you JUST CAN NOT CATCH NO MATTER HOW HARD YOU TRY should be enough of a reason, but there are more. Second, the microbes, bacteria, fungi and other goodies in garden soil may be gold for outdoor growing, but those little seeds have all they need to grow into a nice crunchy microgreen without any additional soil nutrition. Plus, some of what is in your soil may not play nice with your sprouts, growing mold and killing them before you get them on your salad. Third, you need soil that will stay moist but not soggy, and the seedling mix is made just for this. Some people ask if you can grow them without soil which is the difference between sprouting and growing microgreens (sprouting = no soil, microgreens = soil). 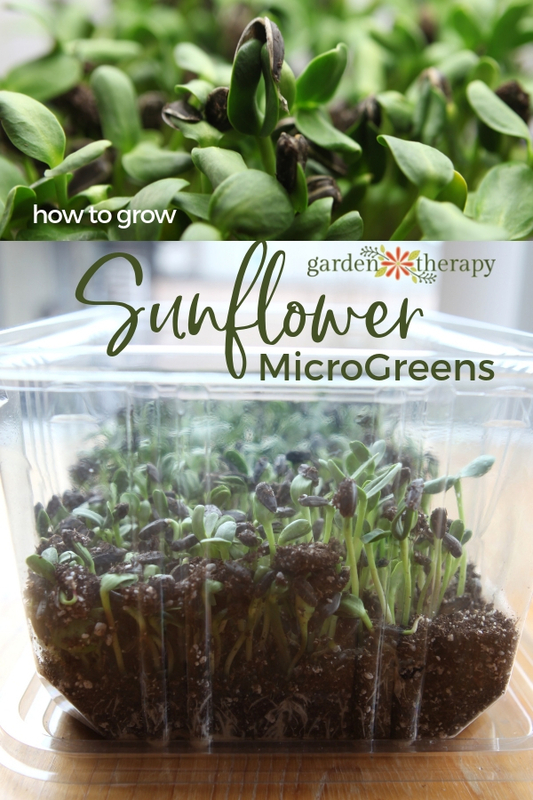 I have done both and I much prefer sunflowers as microgreens. I get many more greens and they last longer. Do you see how the sunflowers push through the soil? It helps to knock of the seed husks and this burst of energy also affects the flavor. Mung beans are like this as well, and to get the best flavor I put weights in my sprouter so the mung beans have to work. But I digress (you can read more about sprouting here). Add about an inch of clean, indoor soil to the bottom tray and spread sunflower seeds over the top. I generously cover the soil with seeds, not letting any of them overlap. Cover the seeds with a wee bit of soil—just enough to hold moisture—and put your mini greenhouse in a warm place out of direct sunlight. Water the soil and keep it moist, but not soggy. You will want to keep some humidity in while the seeds are breaking open, but remove the lid a few times each day to refresh the air inside. 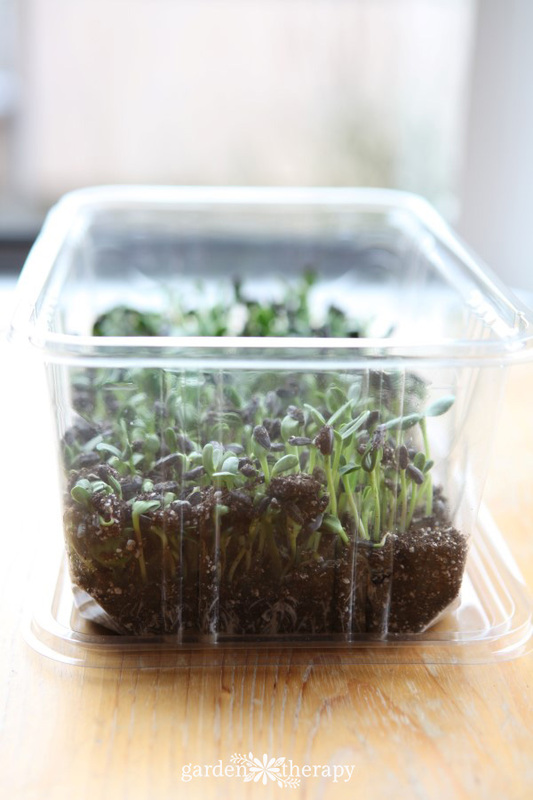 Once the seedlings start to grow, remove the lid altogether and let them enjoy the fresh air. Water only to moisten the soil, being mindful that over-watering can cause rot and fungus growth. The sunflower microgreens are ready to harvest when the mighty seedlings push up the soil, lose their shells, and grow two fat seed leaves. If all of the shells don’t come off, I tousle the tops of the seedlings to dislodge them at harvest time, or else I pick them off in the salad spinner when I wash the microgreens. Snip the seedlings at the base and wash in a small salad spinner (I use this one). I generally keep them in the salad spinner after harvest so I can give them a rinse every few days. I spin them dry and store them right inside the salad spinner in the fridge, as the colander inside promotes good drainage and prevents rot/ mold. Once the microgreens are harvested, compost the soil and roots as they will not regrow. To make a new batch, use clean seedling mix and start again. There may have been some contaminants that have entered the soil from the first batch, plus there will be roots decomposing in the soil that could compromise the new batch. 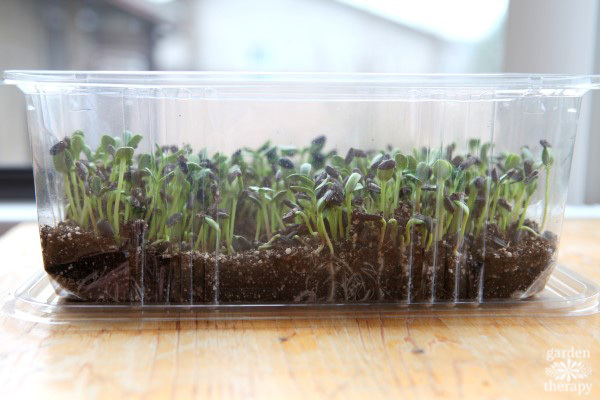 For more ideas, check out growing sunflower sprouts in photos over 17 days: Sunflower Micro Greens: A Time Lapse Photo Journal. This is an older post I did on growing sunflower microgreens in a recycled chicken dome and, while the photos are a bit of an embarrassment, the comments are really helpful to read through. Or check out this post on soilless mung beans and green peas sprouting in a mason jar and in an automatic sprouter. 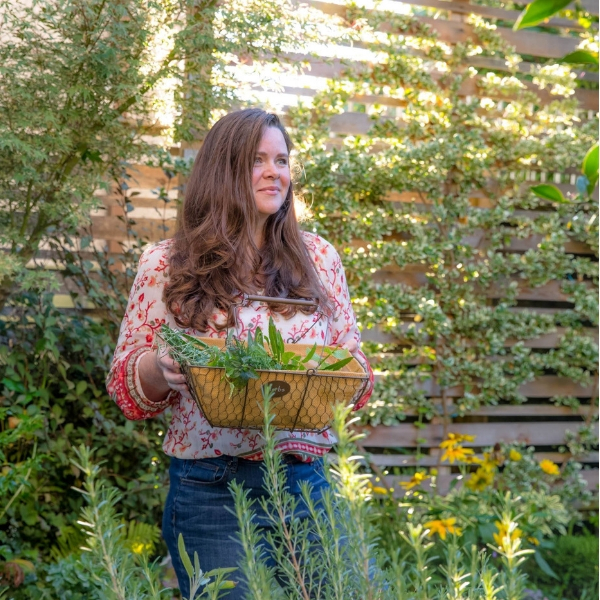 « These Accessible Tools will get You Back into the Garden! I’ve always wanted to do this! Thanks for the tips. 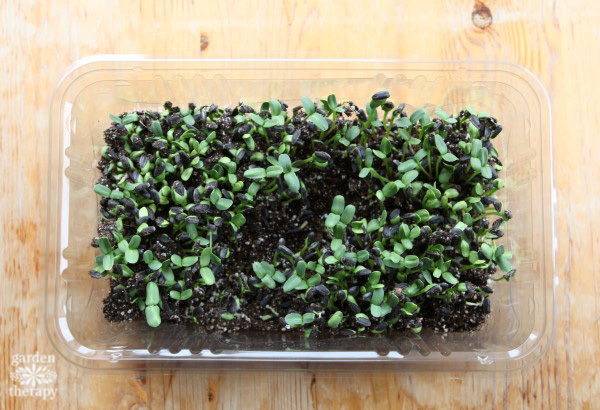 Growing these sunflower microgreens really proves to be easy with this guide you have here. Surely, anyone can do this, right? Thanks for this useful resource! 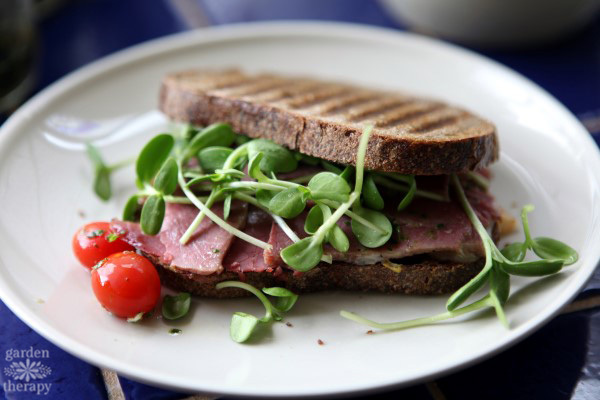 Sunflower microgreens contain enzymes as much as 100 times than full-developed greens, which helps you digest way more important vitamins, minerals et cetera. Plus they offer a standout amongst the most adjusted manifestations of plant protein! Hello Stephanie! Lovely article! I am hoping to try this very soon!! I have a question regarding the soil. How do you store the soil since you are only using a little at a time? Hi Ellie, I have so many plants on the go that I always have a use for soil! 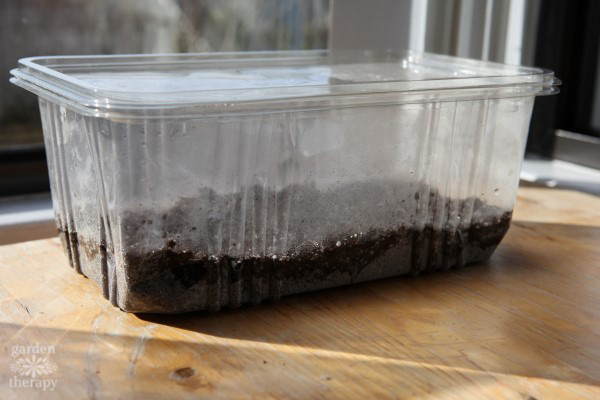 That being said, you can transfer the soil to a large plastic tub with a lid and store it someplace cool and dry. That will keep it sterile and free of those annoying soil gnats that seem to appear when soil is moist. I am using plastic mushroom punnetts with potting soil. Eight can be fitted in a 10×20 flat. A dozen drainage holes are made in the punnett and, once sown, seeds are germinated on a heating pad. When a couple of inches tall, they are moved under fluorescent lighting to green up. The 10×20 flats used are heavy plastic and hold six or seven punnetts plus an inverted mason jar. The mason jar is filled with water, covered lightly with a lid and placed upside down in the flat. The lid is then carefully removed so water can gradually feed the punnetts (for several days, but requiring more as the seedlings increase in size).